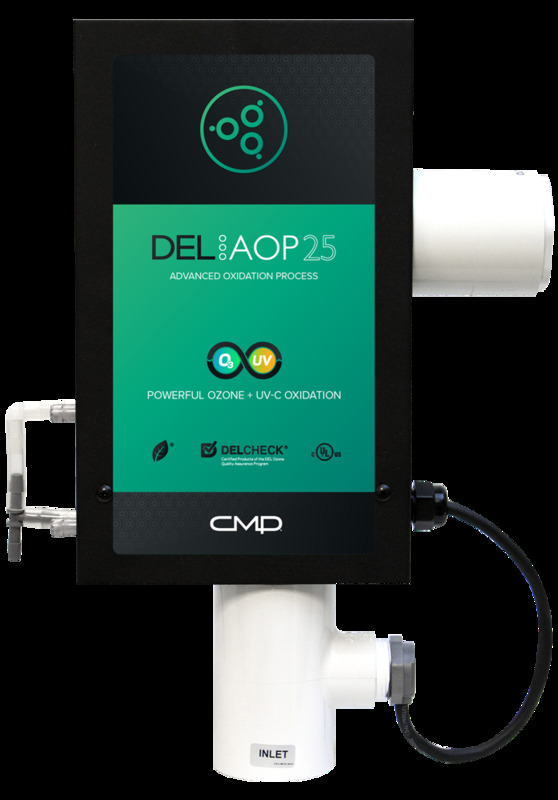 The DEL AOP 25 from CMP is a powerful new compact AOP sanitizer for the complete modern pool. It is easy to install, lightweight, and treats pools up to 94,635 L (25,000 gal). The AOP 25 is safe for the environment and provides efficient, reliable performance. DEL™ Advanced Oxidation combines ultraviolet C (UV-C) and patented Advanced Plasma Gap™ (APG) ozone cells. APG ozone cells last longer and outperform UV and traditional corona discharge (CD)-style ozone generation. Working together, these two sanitizer technologies create powerful hydroxyl radicals. This is the Advanced Oxidation Process (AOP). Hydroxyl radicals are the most powerful oxidizer available for residential or commercial pools. The DEL AOP 25 destroys 99.9 per cent of contaminants and bacteria leaving only clean healthy water behind. AOP quickly oxidizes Crypto, Giardia, and chlorine-resistant micro-organisms. It also reduces chemical demand, as well as odours and irritation commonly associated with traditional chlorine-based systems. AOP is the most powerful advanced sanitizer technology on the market. Hot tub or swim spa, what is the difference?